Infinix Zero 6 was launched on the 30th of march at Radisson hotel Ikeja, Lagos State. 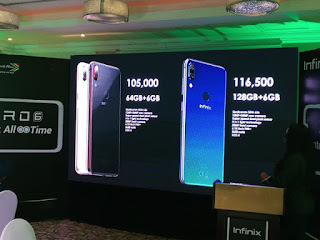 Infinix Zero 6 came with amazing features and it is really a big upgraded version of the Infinix Zero 5 that was released in 2017. Infinix Zero 6 features a 6.2-inches display screen, 6GB RAM + 64GB onboard storage, powered by a Snapdragon Qualcomm 634 processor. It runs Android 8.1 Oreo out of the box, 12 MP + 12 MP rear dual camera, 20 MP selfie camera. The device comes in two variants 128GB and 64GB internal memory, housed by a 3750mAh battery capacity.